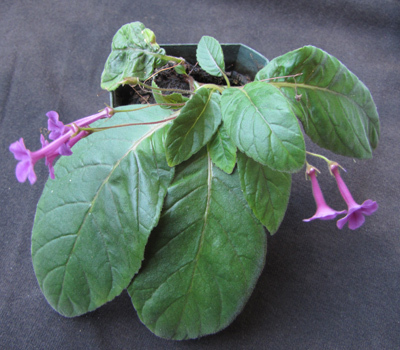 Dale Martens and Karyn Cichocki collaborated to cross Sinningia pusilla with S. helioana. 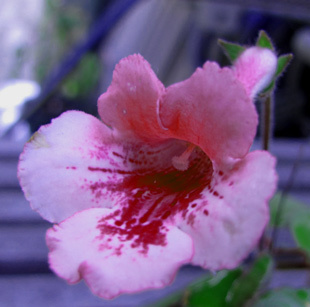 The resulting hybrid has different blooming habits in different houses. Karyn Cichocki sent pollen from her blooming plant of Sinningia helioana (then called Sinningia sp. 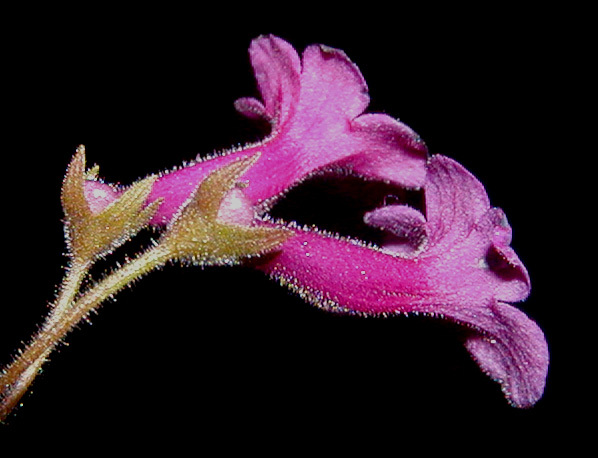 "Santa Teresa") to Dale Martens, who applied it to S. pusilla. This was the result. As far as I know, it is the first hybrid with S. helioana. Since the molecular data indicate that this species is closely related to the miniature species, including S. pusilla, this plant should be fertile, but so far [as of 28 October 2010] Dale has not succeeded in setting seed on it with pollen from S. pusilla or S. muscicola ("Rio das Pedras"). I failed to get seed by applying pollen from S. helioana. Both Dale and I observed the same thing: while the pedicel of an unpollinated flower withered right away, the ovary of a pollinated flower would begin to swell as if fertilization had succeeded, but a couple weeks later the pedicel would collapse. Dale has named this plant "Heartland's Flashlight". Explaining the name, she wrote, "[Karyn] gave me ST's pollen and when I had a first bud, I was so anxious to see if the bud opened that I'd go into the plant room daily around 4:00 a.m. with a flashlight to see if it had opened yet." 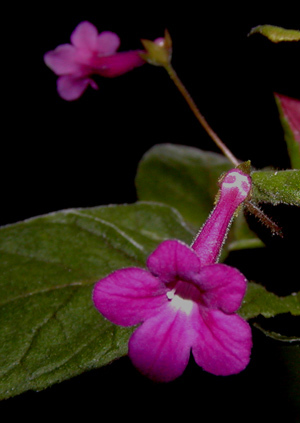 Flowers of S. helioana have white throats and are held facing downward at an angle. Dale says that "Heartland's Flashlight" flowers also have white in the throat and sometimes nod downward, although, as is evident from the picture, not as close to vertical as those of the pollen parent. 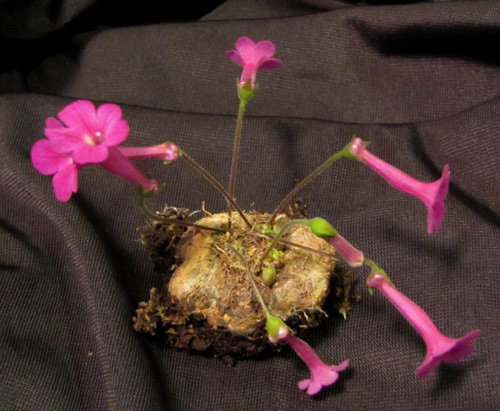 When young, Dale's plant resembled a standard miniature sinningia hybrid in habit, with a short stem, somewhat curled leaves with reddish backs, and flowerstalks growing from the center of the rosette. With age, however, the plant acquired a trunk, as seen in the picture above. Dale reports that the plant didn't appear to have pollen when young, but as it got older, it finally produced a little pollen, giving her hopes of selfing it. My plant, which I got from Dale, has bloomed but is still in the compact pre-trunk stage mentioned by Dale above. The next three pictures are of my plant. The pot size is 2 inches [5 cm] square. Despite its small size, the plant has already (as of March 2009) produced two scions to give away. One obvious difference between this hybrid and both of its parents is apparent petiole length. Sinningia pusilla has petioles which are about as long as the leaf blades, while S. helioana bears leaves at the end of a long stalk. As discussed on the S. helioana page, however, the petiole-looking things of that species are in fact stems, and the actual petioles are quite short. 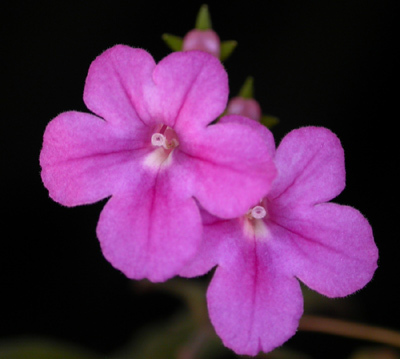 Thus the short petioles of this hybrid were inherited from the helioana parent. The veins on a S. pusilla leaf are slightly indented on the top of the blade, and this hybrid has the same property. S. helioana leafblades have (for at least half their lengths) protruding midveins. Also the leaf texture is very puckered and quilted, none of which shows up in the hybrid. I can't tell how these pictures will look on your computer, but on mine, neither my picture to the right nor Dale's picture at the top of the page exactly captures the color of the flower, which is a very intense magenta. Complicating the issue is the fact that the color changes as the flower ages, becoming more and more purple, leaving the magenta tones behind. Do look at the base of the flower and the calyx in this picture. We now turn to the subject of the calyx. Here it can be seen that the top calyx lobe is pushed back, instead of protruding forward the way the other calyx lobes do. This is because the corolla tube bulges backward, past the point where it meets the pedicel (flowerstalk). This is a trait inherited from S. pusilla, since neither S. helioana nor any of the other micro species (S. concinna and S. muscicola) have that property. The normal blooming habit for this hybrid can be seen above. Actually two normal blooming habits can be seen above. 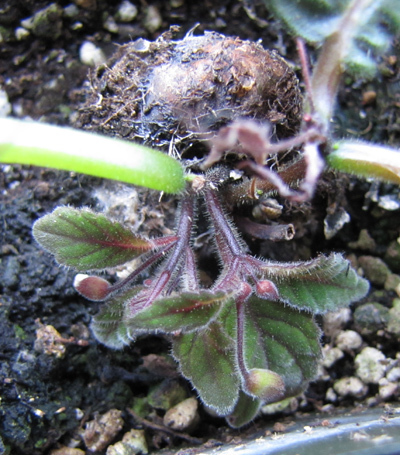 But in the winter of 2009-2010, my plant bloomed directly from the tuber, just like its Sinningia helioana parent. The plant has the genes of both parents, both struggling to control the enzymes and the hormones that regulate growth and blooming. In this case, it appears that they both win! This picture was taken in December 2009. 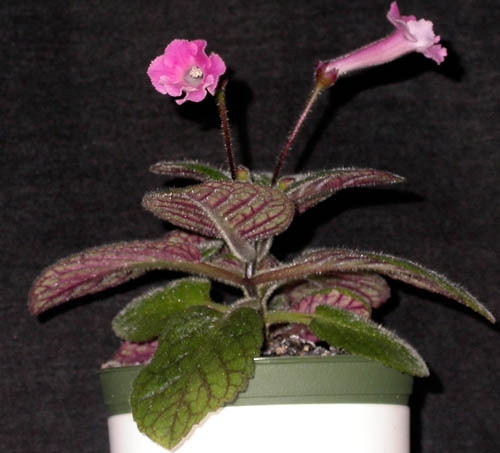 By mid-February 2010, the plant had leaves and was blooming just like a conventional, respectable, well-bred sinningia. This photo was taken in May 2015. 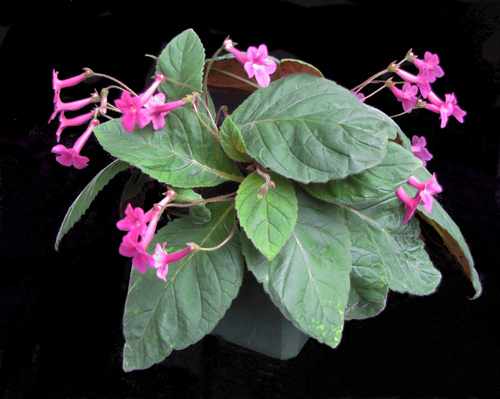 A print was exhibited at the Gesneriad Society convention in July of that year. It shows the plant at the peak of its blooming. This photo was taken in October 2015, of the same plant. Time to worry? 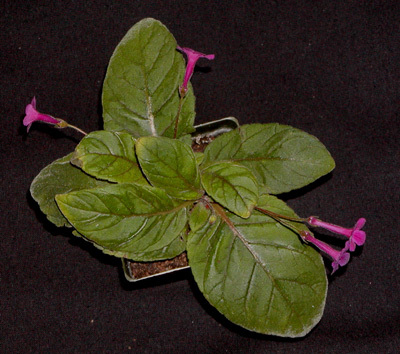 This photo, taken the same day as the above one, shows a different plant, propagated from the first one (and thus genetically identical [in theory]). This plant has declined and is now starting a new growth cycle, with visible flowerbuds. 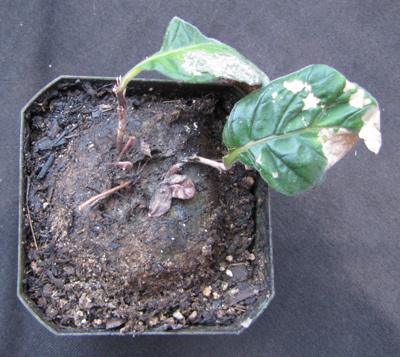 This plant and the previous individual were growing on the same light stand, and were thus exposed to very similar conditions. This photo, taken the same day as the previous two, shows a third plant, in a growth state quite different from the other two. This plant was also propagated from the first one by a cutting. This plant has been growing in natural light, in a window. The message here seems to be that this hybrid has growth cycles that aren't rigidly tied to the calendar. It grows and blooms for a while, then declines and goes dormant (not necessarily dropping all its leaves), after which it begins renewed growth. 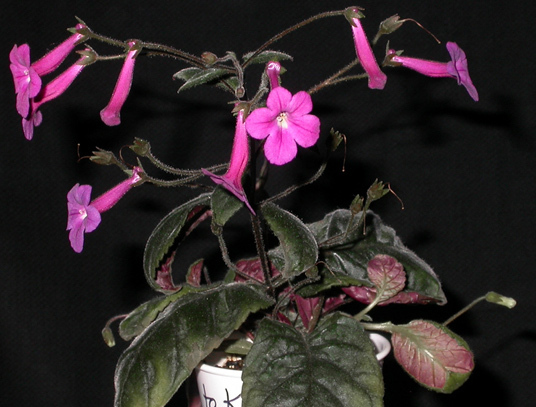 Sinningia 'Heartland's Flashlight' has proven to be a difficult subject for hybridization. Although it should be fertile, it makes little or no pollen and is unwilling to accept pollen from even related sinningias. The result was a few seeds and one of the seeds resulted in the flower seen here. Note the 6 corolla lobes. This is the whole plant. Dale has named it "Heartland's Parasol". 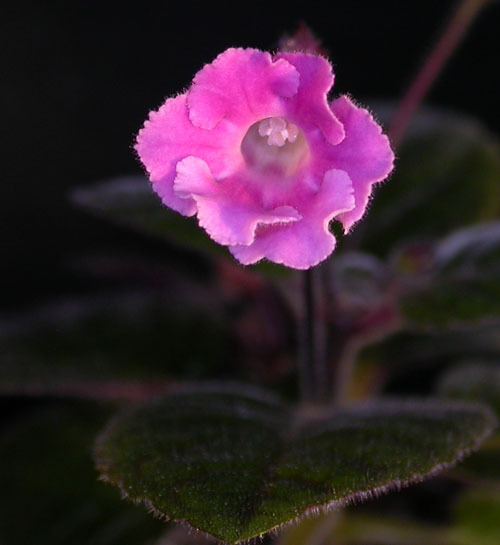 The flower color is quite close to that of the 'Heartland's Flashlight' parent. This shows the flower of Sinningia 'Los Angeles', the Dale Martens hybrid that was the other parent of S. 'Heartland's Parasol'. Leaves Much like those of miniature sinningia hybrids, with maroon leafbacks. Veins indented on top of leaf blade. Dormancy Growth appears to cycle rather than having any kind of strict dormancy. See above. Inflorescence axillary cymes with peduncles of 1-2 flowers. Season Blooming does not appear rigidly tied to season or calendar. See discussion of growth cycles. From seed Four months to bloom, for Dale. For the rest of us, maybe longer. Hardiness Based on its ancestry, one would not expect this plant to be cold-tolerant. I have never tried S. pusilla outdoors, but S. helioana has not survived even mild frosts here. Taxonomic group Both parents are in the aghensis group of the Corytholoma clade.